[ACT](VC)[1/Turn]:COST [Counter Blast (1), Soul Blast (1)], choose one of your units, for the battle that that unit attacked during this turn, while your opponent calls guardians from his or her hand, he or she must call two or more at the same time. 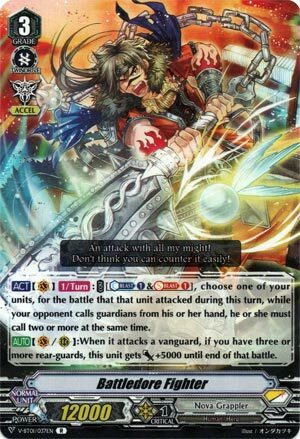 [AUTO](VC/RC):When it attacks a vanguard, if you have three or more rear-guards, this unit gets [Power]+5000 until end of that battle. I WAS going to just fill this week with generic starters until WarLycan came back (nice to know you care, Saikyo 😜 -WL), but that’s immature of me and there’s always the option to save it for a slower week, so let’s review some more Q4 Booster. So for those of you who really hate the RNG that comes with Asura Kaiser, this is the cheaper alternate to Perfect Raizer. He still carries the Accel Gift, which is all that matters. Anyway, the guard break skill is clearly what’s the most interesting part about it, but it needs setup. So for now it’s High-powered Raizer Custom and Burstraizer who are the only ones who can make this carry any actual weight since they either Stand your target for the skill, or itself so it can abuse it twice. Not tricky assuming you max both of them, and why wouldn’t you, but keep in mind this generation of Nova Grappler has less free Countercharging going on, so resources are more scarce. I actually prefer this over Asura Kaiser, largely because you’ll know what you’ll get in terms of Front Triggers and simply because this can destroy more field and hand Late Game, which is what you need.